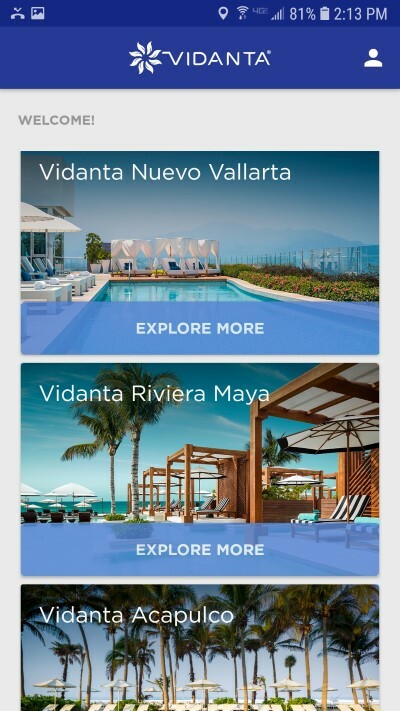 Happiness at your fingertips is the tagline for the new Vidanta mobile app for Apple and Android. Ok, so our friends at Vidanta resorts tend to exaggerate a bit. 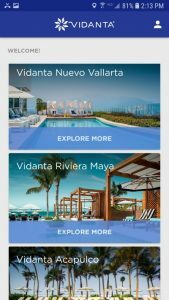 However, the Vidanta app definitely can help make your vacation smoother , easier and yes, perhaps a bit happier. You can get the app at the Apple App store or the Google play store for androids. You start by choosing the Vidanta location. 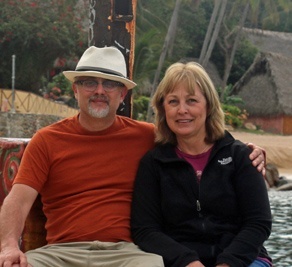 Currently you can choose, Nuevo Vallarta, Riviera Maya , Acapulco and even Puerto Penasco. Let’s walk through useful things you will find. When you open a location, the first you thing you see is “Events and Activities” and “Dining Locations” . don’t miss the menu items at the bottom. 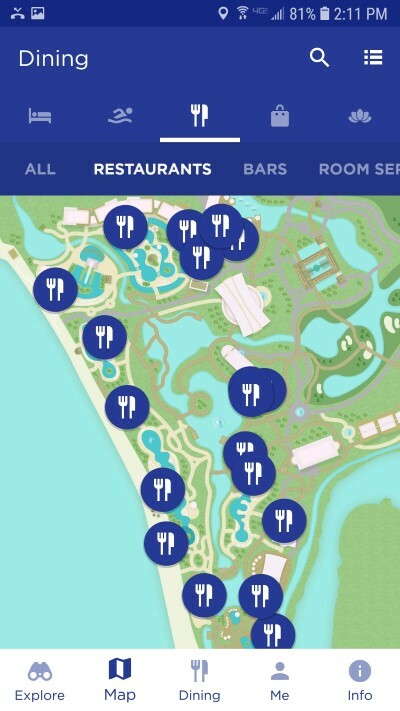 There is a link to an interactive map, another Dining link that is the same as the “Dining Locations” icon at the top, a “Me” menu item to customize the app for yourself and finally “Info”. Let’s explore each area of the app. This section is a great way to find kids activities, special events at restaurants , tours, and live entertainment around the resort. You can directly add events right to your phones calendar. Nice ! So what would you like to do this week? Attend the VIP movie night, go on a culinary tour, watch an acrobatic live performance, learn how to make cocktails, or any of literally dozens of other options. 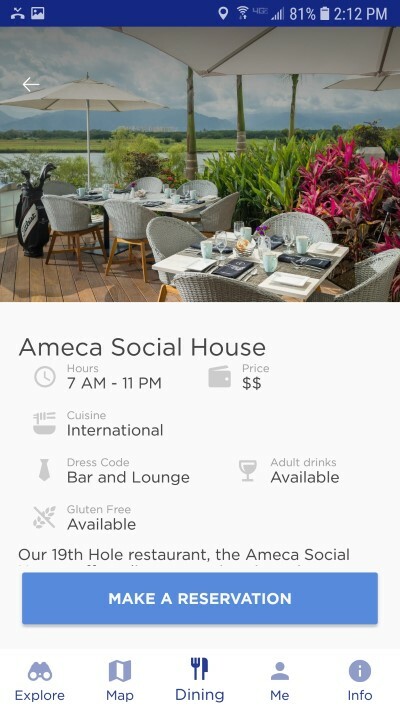 This app is definitely a lot more fun and useful than paging through the resort brochure. 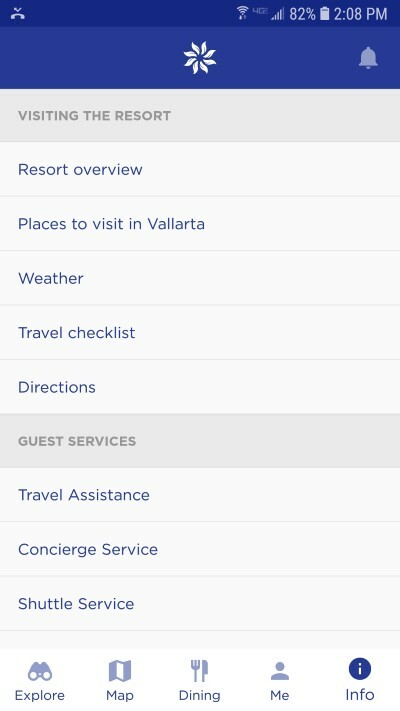 It also includes all the resort locations (Grand Mayan, Grand Luxxe etc) in one place. Very handy. The Vidanta resorts have a myriad of restaurants and it can get confusing. 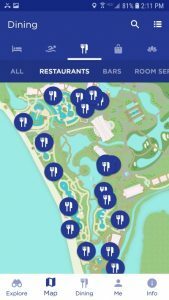 This section of the app solves that problem by listing all the restaurants on the resort AND the complete menus of every restaurant on the resort. Each restaurant listing gives you hours, food type, dress code and a rough estimate how expensive. Here is an important note: They don’t mention that most of the restaurants have one designated day per week that they are closed. So do be careful to phone ahead before heading out to a restaurant on the other side of the resort. The map tab gives you a very useful zoom-able map of the resort. It has icons that filter to show buildings, swimming pools, restaurants and bars. 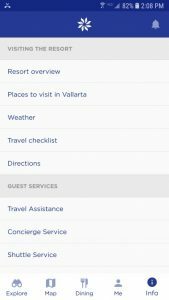 The Info tab has the answers to many of the common questions that you will have while planning your trip and throughout your stay. For information before your trip, the info tab has a weather section, airport pickup information, Golf course and even wedding and event services. 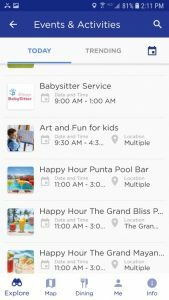 To find your app enhanced vacation, check out Ready to Book weeks or Request exactly what you want.